Taking notes, remembering to-dos, managing time, storing passwords, scanning documents — productivity apps play such a crucial role in our lives. 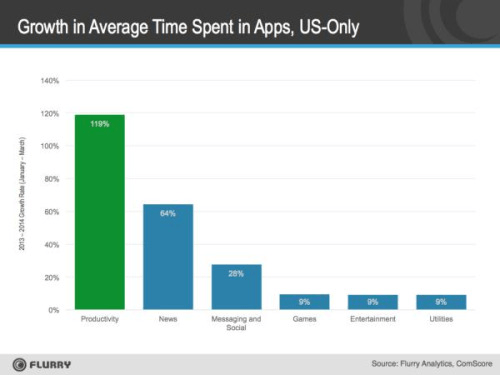 The importance of productivity apps is only going to increase going forward. Microsoft, for example, has productivity at the core of its comeback strategy. A study by Flurry, Yahoo’s mobile analytics and advertising company, showed that the time spent on productivity apps saw the biggest increase compared to all other app categories last year. 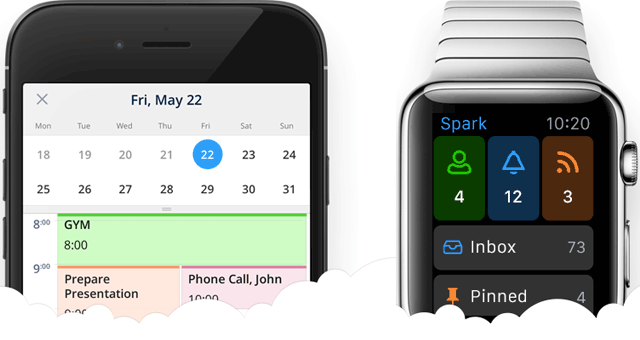 How do productivity apps manage to engage their audience and embed themselves into the daily workflow of millions of people? I decided to seek advice from the development companies of three successful productivity apps to find out their secrets to success. Here’s what I found out. It’s no secret: To be successful, a product must be well-loved by its users. “Our users love our product and what it helps them do. That’s the best way to engage and retain them,” says Alice Default, who heads marketing for Sunrise, a free calendar app. Sunrise was acquired by Microsoft this year. Denys Zhadanov, Director of Marketing at Readdle, a company that has eight apps in the productivity space, agrees. “Just focus on building a great product and a cool human brand around it,“ says Zhadanov. Readdle’s apps have 5-6 million monthly active users. Their apps have been downloaded a whopping 33 million times. While having a great product goes a long way, you still have to ensure users get maximum value out of it once they start using it. 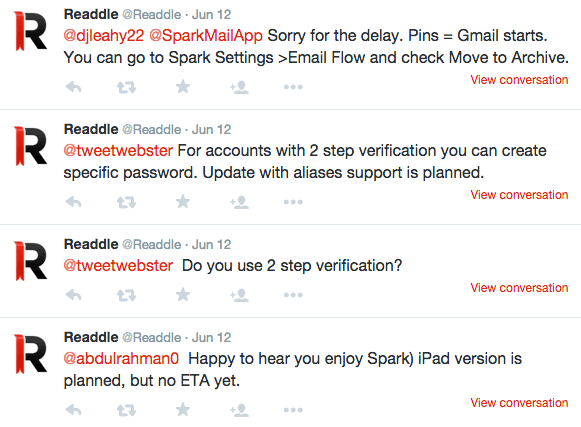 Readdle educates users by sending them email newsletters containing tips and tricks about their apps. David Rostan is the head of organic marketing at Dashlane, a password manager and digital wallet that has over 3 million users. Rostan says they also provide product guidance through emails and notifications based on the user’s activity. Sunrise uses in-app messages to announce new features that help their users do more with the app. The idea behind using in-app messages is to be as unintrusive as possible. It also gets the message to users at the right time and in the right context. The number of channels customers can raise complaints, ask questions and give feedback on is ever-increasing. From email to social media platforms to third-party review sites, existing and potential users have many platforms available at their disposal. 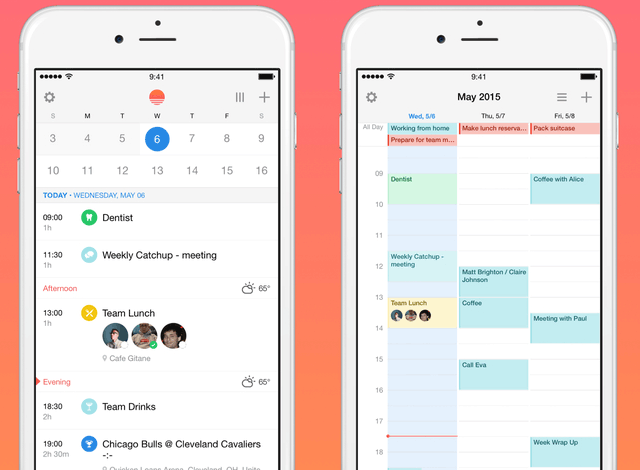 These productivity apps can manage it all. It’s a key pillar to their growth. “We respond to every support email, talk to them on social media in a very friendly way, release updates often and listen to their feedback,” says Zhadanov. At the end of the day, when it comes to measuring the results of their efforts, customer happiness is the unanimous success metric. “If it’s used by millions, and people love it, that’s all that matters. Running into someone who has your app in the Dock creates a great feeling,” says Zhadanov. Sunrise measures customer happiness by tracking app reviews, customer emails and tweets, and by surveying their users. This gives them a sense of how they are doing on a regular basis. 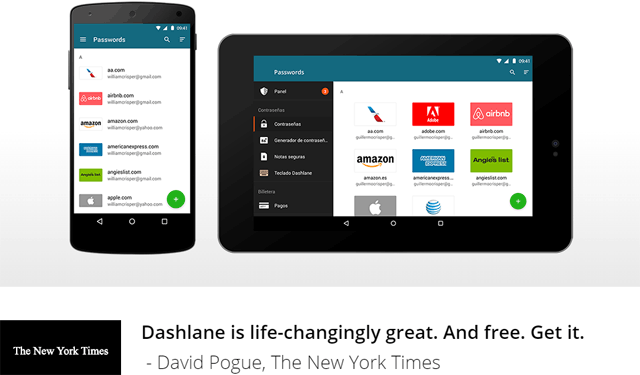 In summary: How did Sunrise, Readdle and Dashlane grow to millions of users? These are principles and ideas that we can apply to help scale any type of app. And, really, any type of product or service. Sanket Nadhani is working on Upquire, a startup that helps mobile apps increase their ratings. He also heads growth at Wingify, and previously held a marketing position at FusionCharts. He’s from Delhi, India. Join him on Twitter and read more of his writings on Medium.